A meaning of Inoperative EPF account was idle account lying without any transaction. So, any EPF account where no contribution is made for consecutive 36 months was classified as Inoperative EPF account. However, the definition of inoperative EPF account was modified as per amended definition of Inoperative Account (w.e.f. 11.11.2016), an account becomes inoperative after the age of 58 years, i.e., 36 months after the retirement age of 55 years. 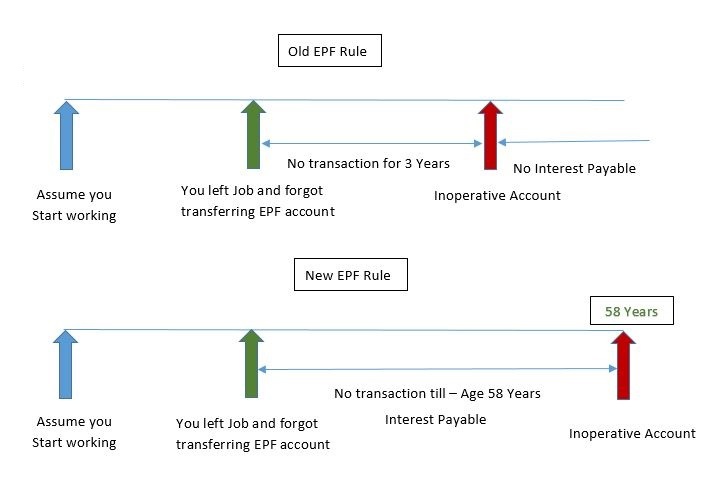 So, if you are changing job frequently and not transferring your old EPF account. No need to worry about EPF account becoming inoperative. Once EPF account is open it will remain operative until your retirement age. However, if you want to track old inoperative account you can track it. You can even withdraw money from inoperative EPF account. As per the old rule, interest shall not be credited to the account of a member from the date on which it has become an inoperative account. However, as per amended definition, an account shall be classified as Inoperative after the member attains the age of 58 years. Hence, interest shall be credited to the account of a member up to the age of 58 years. For further clarification please refer to image given below. Also Read – How to Check your Aadhaar Bank Account Linking Status? Inoperative EPF account – How to Trace? You can trace inoperative EPF account from EPF portal. – You will be redirected to the new page. The system will ask about your login detail. If you have already registered input your username and password or select first-time user and click to proceed. – In the next page, you need to provide problem description stating why your account is inoperative. – Next, is providing information about your Name, Address of company, EPF number and personal details. -Next section is about KYC details. You need to enter PAN number, Account number, and Aadhar Number. Once you are done with entering all information click on “Generate PIN”. You will receive a PIN number on your mobile phone. On entering this PIN, a reference number will be generated. Note down this reference number you will need it for tracking your request. Once your account is traced helpdesk will notify you. How to withdraw money from Inoperative EPF account? The process of withdrawing money is very simple. You need to download a composite claim form from EPFO website and fill up with required details. The form then needs to be submitted to the nearest EPF office. You can expect a response from EPFO within 3 to 20 days. Your money will be directly credited to your account as per instruction in the claim form. As per me, this is welcome step taken by the government of India. Track Inoperative EPF account – How? How to check if Employer is depositing EPF amount with EPFO or not?